After his father dies in a kite riding accident, the last thing twelve-year-old Haoyou wants to do is take to the skies. When other plans for supporting his family are thwarted by his evil uncle, however, it becomes clear that his only means of escaping poverty is to join the circus as a kite rider. As he travels with the Jade Circus in service of the Great Miao, he wows audiences with his performances, and looks forward to one day showing off his skills for Kublai Khan, the Mongol conqueror. This exciting, well-plotted coming-of-age tale is a thrilling read with many wonderful lessons. It illustrates the enmity between the Chinese and Mongol cultures, the role of the circus within society, and Kublai Khan's specific rules regarding punishment and forgiveness. Haoyou becomes slowly aware of some harsh truths about his family, which leads him to understand the benefits of questioning some forms of authority, and to realize the value of thinking for oneself. The heroic feats Haoyou is able to accomplish with his kite also show the power of always striving to do the right thing, no matter the consequences to oneself. There is much to learn from this book, which can be used to spark any number of interesting conversations. Unlike many other historical fiction novels where nothing much happens, this book is truly action-packed. Though there are plenty of moments where Haoyou waxes philosophical about the state of his life, there is also a constant stream of excitement, including scenes involving theft, injury, and death. Haoyou is accompanied through much of the book by his cousin, Mipeng, who is believed to be a medium, even though she knows she can't truly speak to the gods, and she also has her share in the excitement, which is sure to please female readers of this otherwise largely male-dominated story. I gasped out loud several times while reading this book, as the plot took unexpected twists and turns. McCaughrean really knows how to keep a reader interested, as every time I felt that Haoyou was the least bit secure, she would place another obstacle in his path and change his trajectory. Escaping from one situation often leads him into a worse one, and I had no choice but to keep reading to find out how he eventually finds a reasonably happy resolution. The short chapters also contribute to the quick pace of the story. 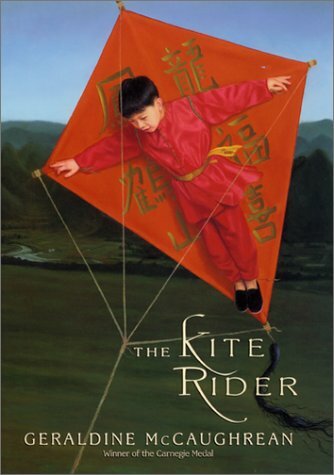 The Kite Rider is most appropriate for young readers in grades 6 to 8, and will appeal especially to readers interested in adventure and family stories. For another kite-themed novel (this one about contemporary Japanese characters), try Flying the Dragon.